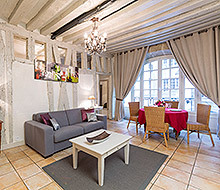 High art and culture surround and reside in this luxury three bedroom triplex in the heart of the Saint-Germain-des-Prés. 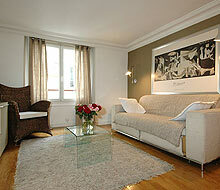 Outside your door you’ll find the Abbey of Saint-Germain-des-Prés and the famous Les Deux Magots and Café de Flore. 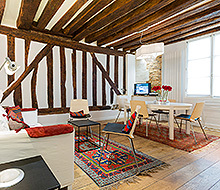 Inside, the apartment features a 13th century wall—what remains of the original medieval cloister—paired with modern architectural design as well as antique French and Chinese pieces alongside contemporary works of art and photography. Tall ceilings and open space frame the primary floor’s multistory windows. The minimal lines and comfortable modern furniture of the two large living areas combine with antique Chinese ceramics on coffee tables and on the mezzanine. The kitchen area offers dining for six, additional window views, and new appliances. With a modern and sleek look, the gourmet kitchen is fully equipped. It also includes a marble island, stone walls, and overhead lighting. The primary floor features a WC with washbasin as well as stairs to the mezzanine level. The mezzanine hosts the master bedroom, an original Louis XV baroque desk, volumes of rare books, and a view of the floor below. The bedroom’s medieval stone wall lends a warm appeal to this open floor. Bath and bedroom are here combined, featuring a king-sized bed, a large stone bathtub with shower nozzle, lighted vanity and washbasin, and WC. The bedroom also has an elliptical machine. Descend to the lower level and find an extensive art library housed on sleek aluminum shelves as well as original paintings, blue velvet couches, and exposed wooden beams. Open and with views of the abbey, this level offers two seating areas, a fully equipped kitchen, separate entrance, and a Saarinen dining table for four—perfect for entertaining or intimate down time. The lowest level also has two bedrooms. One has a queen-sized bed with a pocket en suite bathroom behind sliding wall. The bathroom has a washbasin, WC, and beautiful freestanding bathtub sitting before a mirrored wall. In the second bedroom, a couch unfolds into a queen-size bed and a wall conceals the en suite bathroom. The bathroom features a shower, washbasin, and WC.